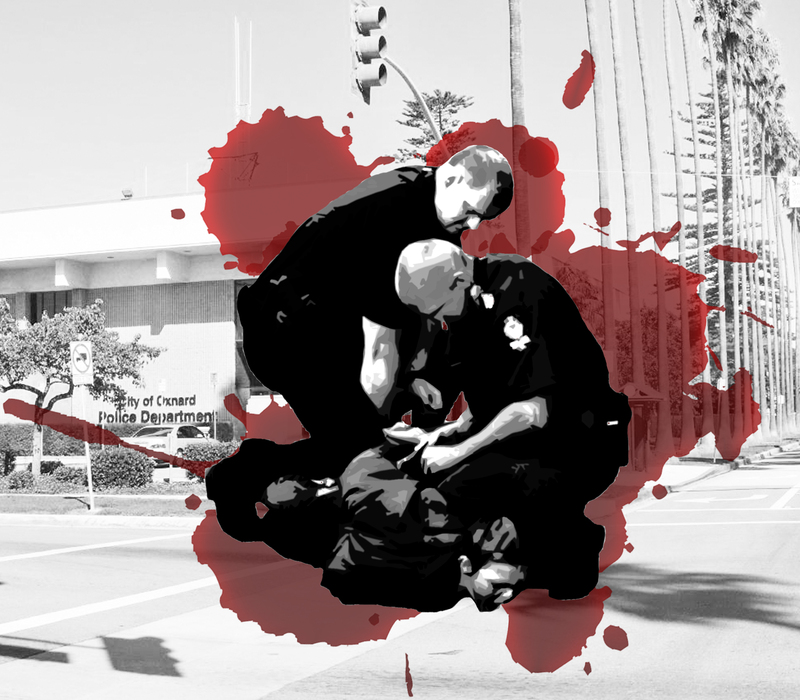 NO JUSTICE, NO PEACE – KILLER COPS OFF OUR STREETS! Victims of police violence, including the families of Officer-Involved Homicide victims, stood at the forefront of the march making the October 22nd action a claimed victory for our community. The march was strong, displaying unity and discipline. Despite treacherous claims and rumors spread by anonymous residents that organizers were inciting “violence” and calling for a “riot” the protest was peaceful throughout. Outside of the Oxnard Police Department (OPD) headquarters, youth used chalk to outline bodies representing the victims of Officer-Committed Homicide and drew messages denouncing police brutality. Most of these messages were written in front of the OPD building while some youth spontaneously wrote their messages on other surfaces. This was followed by an absurd attempt by the Oxnard Police to smear our march by claiming that this constituted “vandalism” which would be investigated and prosecuted to the full extent of the law. According to the OPD’s perverse notions of “justice”, officers are free to kill the innocent and spray densely populated neighborhoods of families with high-caliber gunfire—and as a result are commended with paid vacation or “administrative leave”—while jaywalking and writing on the pavement with sidewalk chalk somehow constitute serious crimes. However, while chalk can easily be washed away with water, the spilled blood of the victims doesn’t evaporate—it sinks deep into our streets and becomes embedded into the memory and consciousness of our community. The Todo Poder al Pueblo Collective did not initiate our community’s campaign against police brutality. This campaign was, in fact, initiated by the City of Oxnard (local government) and the police department. Our campaign is a rejection of continued humiliation by OPD and a response to every incident of harassment, every casual act of disrespect, every unjust incarceration, and every act of routine abuse by the police. Time and time again, local residents have asked the Oxnard City Council to address this ongoing crisis yet have been greeted with pathetic “responses” that are simply efforts to dodge responsibility and shift the blame. Displaying complete disregard of the community, the council has continuously failed to make any attempt to eliminate the pattern of police abuse that has plagued working-class neighborhoods on a daily basis. Instead, the City Council has shown complete bias in favor of criminalizing our youth, unconditionally sanctioning police misconduct and showing total apathy towards our pleas for justice. 3) The OPD’s pseudo-military style of policing has led to its infamous reputation as a brutal and highly distrusted agency with little credibility in working-class neighborhoods. Our community’s desires are simple—we want brutal cops in particular to be held fully accountable to our community’s basic standards of justice, and we demand that all police officers in general abide by our community’s minimal expectations of dignified treatment and respect. The people of Oxnard urgently demand the FULL prosecution of brutal and corrupt cops, not paid vacation or “administrative leave”. We urge the city to fire guilty officers and not simply release them in a way that allows them to do harm in other communities. Chief Jeri Williams, who inherited this dysfunctional police force a couple of years ago, must resign. If she isn’t willing, or able, to root out the culture of brutality in the OPD, it’s the only honorable thing left for her to do. Our community requires the establishment of an independent community oversight mechanism with the power to punish officers who are guilty of crimes against the people. Most importantly, we need to build a culture of resistance among the people of Oxnard. Unless we continue fighting every day, Robert Ramírez, Michael Mahoney, Alfonso Limón and José Zepeda will merely be statistics. The Todo Poder al Pueblo Collective’s only goal is peace; this is what makes life worth living—just ask the families of the victims! Without peace, our communities become gripped by anxiety and they decompose and deteriorate. However, peace and calm aren’t possible when we’re facing direct aggression, injustice, and the trauma of stolen lives. It would be foolish to confuse “peace” with state-sanctioned repression and pacification by the OPD. Thus, despite recent threats from the Oxnard Police Department to arrest organizers who continue to fight against police brutality, our belief is that the only true power lies in the people standing strong against all forms of aggression or humiliation.